Pharmatopia was our first installation within the framework of the Museo Mundial Project in the Czech Republic. 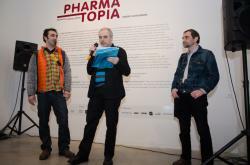 The name Pharmatopia expresses a connection between the pharmaceutical industry and the word “utopia”, which refers to an ideal society. The installation, which was created in conjunction with the artist Marek Schovanek, provides a very different perspective on the concept of “trust in pharmaceuticals”. 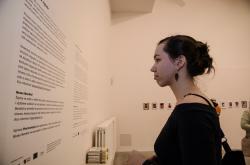 It was installed in the Dox Centre for Contemporary Art in Prague. The installation is based on the existing exhibition material of Marek Schovánek. 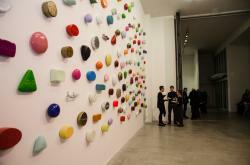 It consists of hundreds of objects resembling pharmaceutical pills marked with the symbols of people´s dreams or worries. On the objects, there are different signs and symbols pointing to problems within our society that can be, according to some people, solved through technology, such as hate, freedom, love, passion, pain, sadness and hope. The key question is: are medicines offered to us purely in order to fight diseases or should they also lead us to believe in a future dream-reality? Marek Schovánek’s installation represents the reality of the dreams that the modern pharmaceutical industry sells us, while simultaneously criticizing our excessive needs. The exhibition also touches on the issue of the extent to which the global distribution of drugs is focused on economically developed countries, ignoring the needs of people from hitherto undeveloped countries and regions. According to the World Health Organization, access to pharmaceuticals remains a major problem for poor people in less developed countries. In low- and middle income countries, only 60% of medicinal drugs are provided through the public health services. In the private sector, the prices of basic and essential pharmaceuticals are five to six times higher than international reference pricing. There are accompanying texts, which briefly outline the situation on pharmaceutical production and distribution in the least developed countries. This underlines the contrast between the progress promised by pharmaceutical technologies and the cruel reality behind them. The colourfulness of the pills conveys to visitors an image of a colourful and joyful future and promises that their sorrows will be healed. However, is this offer of a better life really genuine? Or is it just a utopia giving people false hopes? In this way, the installation provides a very different perspective on the concept of “trust in pharmaceuticals”. The installation was installed in an exhibition hall right next to the entrance to the yard of the DOX Centre for Contemporary Art in Prague. We started to develop the installation concept and to discuss it with different artists, architects and experts . In this way, we arrived at the basic concept for the installation. This process took us about five weeks. The DOX Centre for Contemporary Art is one of the most famous Czech art galleries and, therefore, likely to have a strong impact on the public, which is why we chose this location. The most protracted part of the negotiations was over [the conditions of the installation] in the gallery. In the beginning, negotiations appeared straightforward, but ultimately it became clear that the needs of the Museo Mundial Project were not immediately compatible with the normal everyday operation of the gallery and its programme of activities. In the end, the gallery’s board gave permission to proceed and recommended several artists who might collaborate with us. One of them was Marek Schovánek, who ultimately was the one to create the installation. This process took us around four weeks. We contacted Marek Schovánek, with whom we communicated mostly electronically since he lives in Berlin most of the time, and it soon became clear that he was interested in collaborating with us. This led to a meeting in Prague – at first only between the artist and Museo Mundial representatives but later also involving representatives from the gallery. Consultations with the artist and preparation of materials was a very creative process with effective cooperation between all parties. The artist was very open to cooperating with us and he was very active in developing the exhibition. This step took us about five weeks. In conjunction with the gallery and the artist, we finalized the installation concept. Initially, we planned for the installation to remain in the gallery for a year. Unfortunately, in the end, we could only exhibit it for two months. Nevertheless, we accepted this change because we felt that this very famous gallery would attract many more people than a normal museum. For us, it was also important to maintain good relations with the art community. This process took us about three weeks. 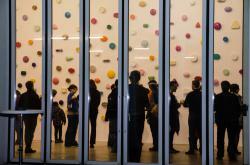 The DOX Centre for Contemporary Art prepared all the necessary facilities in line with the artist’s wishes. The museum carried out the necessary construction work at their own cost, increased the level of lighting in the room and prepared everything needed for the launch including refreshments. Five thousand leaflets were printed for the exhibition and every visitor to the museum was given one. Materials informing visitors about the MDGs were placed under the information about pharmaceuticals. The booklet about MDGs and the post-2015 agenda entitled “From Executory Plans to the New Goals” was printed by the NGO Czechia against Poverty (GCAP Czech). Technical issues were handled very professionally by the gallery, as part of their complete technical support service. The DOX Centre for Contemporary Art needed five working days to install everything in line with the artist’s wishes. The installation was completed through close collaboration between all partners: the museum, the artist and EDUCON. The launch of the installation was organized in conjunction with EDUCON, who invited the guests. 130 people attended the event. The installation was prepared very professionally and the supporting documents were good. Many people visited the installation – more than 7000 according to our statistics. The installation was successful in bringing the topic to the attention of the part of society interested in contemporary art. Consequently, we would recommend this installation even it was only displayed for two months. Because this installation received more public attention in two months than it might receive in a whole year if it was located at another museum. The installation was exhibited only for a short period of time.